Revista Mensual Dedicada a Combatir el Espiritismo. Lérida, Spain. Language: Spanish. Editor: Rev. Niceto Alonso Perujo. 1/1, 1875. 20 pp., 20 pesetas a year in Lerida, 24 outside. 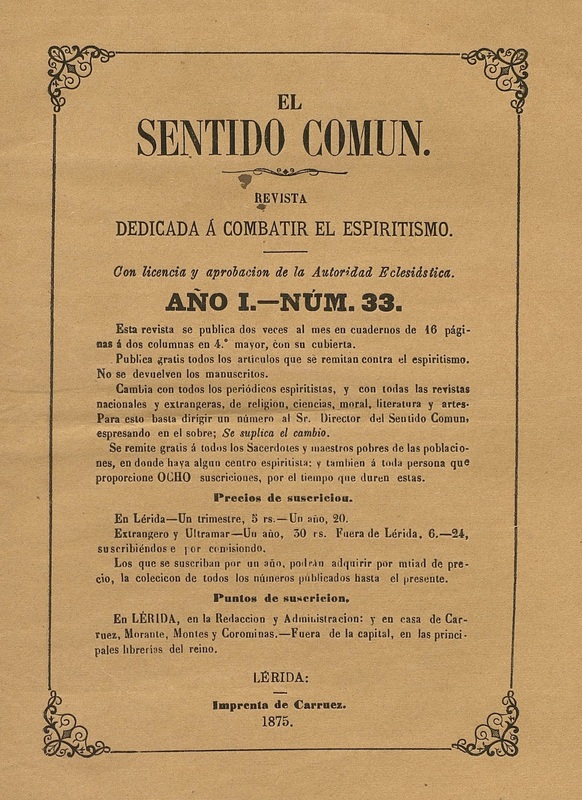 It was opposition to this Catholic, anti-spiritualist journal that prompted the creation of El Buen Sentido of Lerida. The journal was devoted to a detailed theological criticism of spiritualism and "modern magic," and supplemented that with documents on the official Catholic response to these and other modern movements. See Oscar M. García Rodríguez, "El Buen Sentido, Revista Espiritista de Lleida," online at http://www.espiritnet.com.br/Flama/Ano2005/Flama01.htm. BNE.